Unlockar, a start-up working on amalgamating marketing and technology domains, is coming up with their maiden app for android based phones featuring a concept named as the uScreen. This unique app delivers exhilarating user preferred content through a new and intelligent lock screen for your phone. 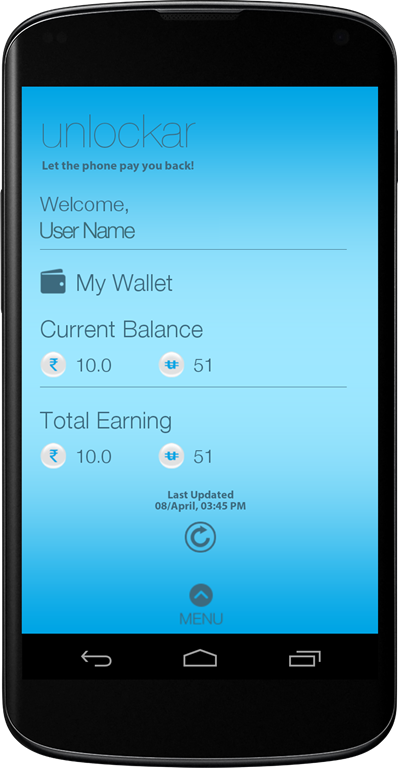 Every time you unlock your phone, the app rewards you in the form of rupees or uCoins which can subsequently be used to obtain deals, discounts, shopping vouchers, or even bid at auctions at the uShop, Unlockar’s online shopping portal. The lock screen content has been categorised into different channels – a few interesting ones being – Incredible India, Who Said It!, ROFL, Fundoo Facts, Blast from the Past, Girl Gang, Bro Code, Wanderers for Life, Deals and Discounts and Mad about Ads. Users can subscribe to the channels of their choice and ensure a wholesome entertainment experience directly on their uScreen. But how does that let you avail a free service? Every time users unlock their phone, they are rewarded with either real money or uCoins which can be used to buy interesting deals and products at the uShop or bid at auctions on the Unlockar website – www.unlockar.com. Unlockar lets the user avail location based deals and discounts, buy products or bid real time at ongoing auctions – All this using the uCoins earned by them just for unlocking their phones. The dynamic and content rich lock screen is being positioned as an alternative to the rather static and monotonous default lock screens that are set by default on the android phones. In the process, Unlockar is offering to reward its users for doing something they always do – use their phones, and an avenue for them to spend their earnings in the real world buying products and services they already use. Users also have an option of subscribing to an On-Demand Ads Channel – Mad about Ads which makes them earn real money every time they interact with ads of their choice directly from their uScreens. The users can use the money so earned to buy shopping vouchers or donate to their preferred charity. “We aim to cater to the speed of today’s youth, so there’s no waiting around to accumulate huge credits before you redeem it. We have collaborated with BookMyShow, FreeCharge and Paytm, our reward partners, to give our customers the experience of real money, starting from the cash-out amount as low as Rs. 20 per transaction.” said Piyush Paul, Director, Marketing at Unlockar. What make this app exclusive are the innovations that enable the phone to have a more rewarding relationship with its users, surprising them every time with new and more rewarding ways of doing things they always did. As an introductory gesture, Unlockar is rewarding its 10,000 first time users with a welcome bonus of Rs. 10 credited directly into their Unlockar wallets – Shop, Donate or Cash-out; it’s all up to them.